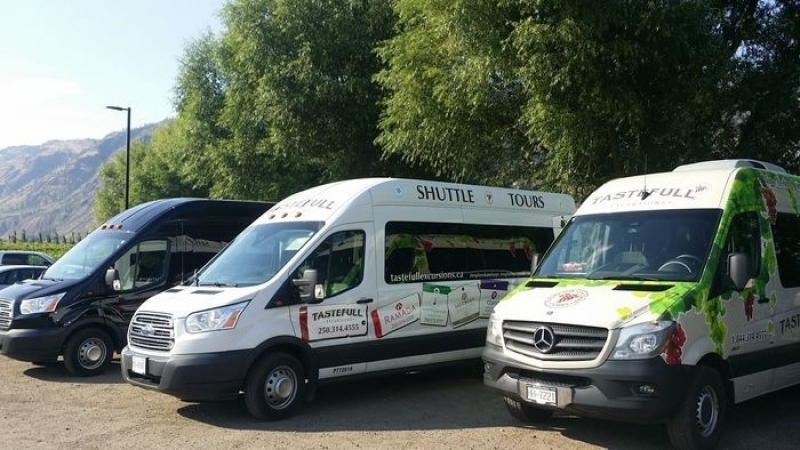 is the premier wine tour operator in the Thompson Valley and is also recognized as the Official Transportation Shuttle provider for Sun Peaks Resort. With early support from the Kamloops Wine Trail, industry partners, Kamloops residents, positive media coverage and the ongoing support from the Sun Peaks Grand Hotel, the company has grown into a year round premium tour and shuttle service provider wtih 11 buses primarily comfortably appointed 15 seat Ford Transits. With the black and gold branding for our deluxe shuttle service, we are setting the "Gold Standard for transportation in B.C." In 2017, TasteFull Excursions was awarded the multi-year contract to become the official shuttle service provider on behalf of Canada’s second largest family ski destination: Sun Peaks Resort. This valued industry partnership provides service for up to as many as 200 people per day in the winter season transferring Sun Peaks’ guests, ski gear, luggage, and incidentals to/from the Kamloops Airport (YKA). Inter-resort and charter connector services are also provided to neighbouring Silver Star Mountain Resort, Big White Ski Resort, Revelstoke, Whistler, and two world renowned heli-ski operations – Mike Wiegele Heli-Skiing Resort and Canadian Mountain Holidays (CMH), in Blue River and Valemount respectively. In addition to guided wine tours and winter transportation, TasteFull Excursions provides year-round transportation services that includes: shuttles for hotel/airports, weddings, golf groups, corporate incentive programs, company conferences and more. Since her early twenties, Maatje has been immersed in small business & entrepreneurship. One of her key strengths has been to recognize and act on business opportunities that are interesting and fill a market gap. Over the years, Maatje has been a business owner, consultant and project leader across a diverse range of industries providing services to advertising agencies, tech companies and the tourism industry. In the past, Maatje has held board positions for Chambers of Commerce, the BC Technologies Industries Association, Powell River Economic Development Society and the Northwest Science & Innovation Society. She played the lead role in building the business case for tourism marketing in Powell River and was instrumental in the creation of Tourism Powell in the early days of the tourism stakeholder model. 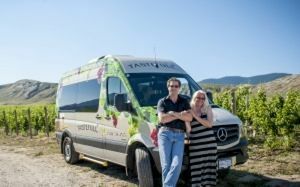 Upon her arrival to Kamloops, she discovered the opportunity to launch the city’s very first wine tour company. With decades of business and volunteer experience, Maatje is excited to see the growth and diversification of her original wine tour company into the full-scale enterprise that it has become. Maatje and the management team will be working together to diversify the menu of tour packages, expand the winter ski resort connector service offerings, and further elevate visitor experiences within the Thompson Valley and the Okanagan. Since TasteFull Excursions inception, Maatje has recognized the need for industry standards and has actively lobbied for the creation of an association to represent the interests of small and medium sized transportation service providers. As a result, Maatje is now the Kamloops representative for a brand new association providing a voice to all stakeholders on important issues. Board members have had similar concerns and there are representatives from across the Thompson and Okanagan Valleys. Born and raised in B.C., Gordon was a career banker for 38 years in various communities in rural B.C. before joining his wife Maatje full time in the business in 2016. Gordon took on the role of building the winter ski resort business. He is responsible for ensuring that the shuttle operations are running smoothly and acting as lead contact for Sun Peaks Resort. Tim Foster has over 30 years of experience in ski resort management and has cultivated strong relationships within the ski industry. 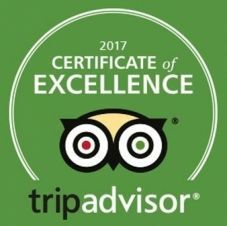 His leadership skills, ski industry connections and his commitment to consistently providing an exemplary standard of service to guests in the tourism sector will help TasteFull Excursions build and maintain the highest level of service excellence moving forward providing much needed support to Gordon’s area of responsibility. Joyce is a Kamloops native with 20 years of experience with BC’s first wine tour company in Kelowna. In her role as General Manager. Joyce transformed the company from a home-based operation to a commercial location complete with a fully-integrated online booking system featuring offers with popular booking engines such as: TripAdvisor’s Viator, TravelZoo, and HelloBC. Joyce’s history in the tourism industry spans from the 1990’s where she worked for Thompson Okanagan Tourism Association, and subsequently left their employ as an accredited a travel journalist. Joyce was a feature travel writer for WestJet’s Inflight magazine, as well as, Cathay-Pacific’s exclusive, The Club Magazine, Source Media’s, Resorts Magazine, and editor for the tourism guides for the cities of Kelowna, West Kelowna, Penticton and Quesnel. Her love of horses and her interest in the western way of life earned her the editorial position for the BC Rodeo Guide for several years. As her recognition grew in the publishing industry, Joyce became the founding editor of Savour Magazine, and Wineries Refined of British Columbia. Her consistent presence working within the wine and tourism industry over the past two decades has evolved into her bringing her expertise and her vast connections to TasteFull Excursions. She looks forward to creating memorable experiences and multi-day packages for travelers from around the world to our expansive region. TasteFull Excursions is proud to have Maatje as the founding member of the board of TOTO representing the Thompson Valley generally and Kamloops specifically as Director at Large. TOTO will benefit from the contribution of both Maatje and Joyce's combined depth of tourism and business experience across BC and the Thompson Okanagan. Joyce spent a considerable amount of time in her former position as GM of Okanagan Wine Country Tours helping lay the foundation for the new organization's vision, constitution and bylaws. Her contributions are highly appreciated by the founding board. Their shared commitment to service excellence will be well utilized in building this organization moving forward. TOTO will provide a long overdue voice for tour operators in the tourism industry. The member-based association’s mandate will be to promote the highest level of understanding, professional practises, collaboration and cooperation between tour operators and the industry partners that they serve.